September was a whirlwind of activity, but it was also a great deal of fun, despite the lack of sleep and scratchy throat that I now suffer from. 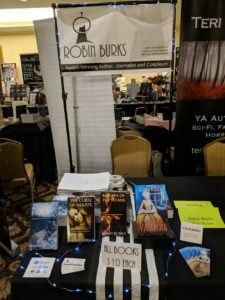 That fun is thanks to you, my readers, for coming out to see me at SEMO Con, Penned Con and Steampunk Who. So I would like to offer a huge heartfelt thank you to everyone I saw at these three events. A huge thank you to everyone who came and talked to me about my books. A huge thank you to those of you who bought my books. A huge thank you to the con organizers who put together some awesome events. THANK YOU. With that said, I am officially done with signing events for the year. I am going to rest up and prepare for my vacation at the end of the month (we are Disney World bound) and then start thinking about what comes next. So what comes next? I plan on spending the last few months of the year knee-deep in writing. I started a novel earlier this year, but I got stuck and somehow ended up not finishing it. Then life got busy, and I had appearances to promote and, suddenly somehow it’s October. I plan on returning to that novel and getting a rough draft written by the end of the year, though. After that, I’ll put it away for a while and start doing some rewrites of another novel, which will probably be Children of Magic or The Book of Revelations. But I will always be working on something because I hope to have a new book published each year. In the meantime, I hope you all enjoy the books I have already had published, and if you need more reading material, please visit my wonderful publisher, Crossroad Press. Thank you all again for your support and here’s to an awesome Halloween/fall season!